Thanks in part to continued support from the William Penn Foundation and a new grant from the National Endowment for the Arts, Lantern Theater Company is expanding its roster of core partner schools. Each year, core partner schools are provided with classroom residencies on a subject of each school's choosing, centered around required curricular material. During each residency, a team of experienced teaching artists visits the school to help students engage more deeply with assigned curricular material. Unlike many other theater education programs, Illumination residencies are not focused on "theater appreciation." 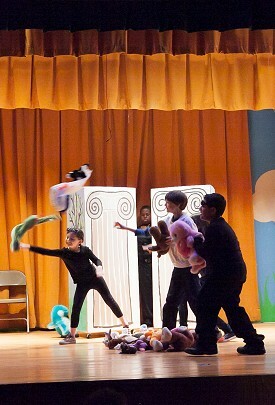 Rather, we have found that the tools and techniques used to create great theater also help students engage more fully with assigned curricular material in new and exciting ways. Additionally, the structure of theatrical presentation requires that students apply themselves to the material in ways that develop key long-term life skills that are crucial for long-term success for all students regardless of their future career path. Classroom teachers at core partner schools are offered Act 48 Continuing Professional Education credits though workshops that demonstrate how to use our theatrical techniques in the classroom, ensuring that they are fully prepared to not only carry the Lantern's approach forward in future years but also to adapt our techniques to new subjects and topics. If you are interested in becoming a core partner school or planning a paid residency, please contact M. Craig Getting, Education Director, at cgetting@lanterntheater.org or 215.829.9002 x104. When selecting core partner schools, special consideration is given to schools serving students with special needs, English Language Learner students, and/or schools with a high percentage of economically disadvantaged students. Pictured: Students participating in the Lantern/ASAP after school partnerships program. Photo: Philadelphia ASAP.